Astronerd LOVES dinner! Eating is a small portion of it, what matters to her is the ritual of gathering together at the end of the day, seeing each other and talking. Oh, and eating. Sometimes I get into my meal planning groove and life is good. I wish it happened more often. In an effort to be more consistent and after reading lots of reviews, we are trying this. So far, so good. The food has been good, the meals easy to fix and the grocery budget is low. I wonder how on earth some of it got into my home to begin with. I must remember 1. I am not the only one living here and 2. Tastes and interests change. I don't know how many times I have picked up an item and said "What was I (or other family member) thinking when this came to live at our home?" Anyway, if you want an inside look at what is departing our home, stop over there. "We talk about our trials and troubles here in this life; but suppose that you could see yourselves thousands and millions of years after you have proved faithful to your religion during the few short years in this time, and have obtained eternal salvation and a crown of glory in the presence of God? Then look back upon your lives here, and see the losses, crosses, and disappointments, the sorrows. . .; you would be constrained to exclaim, 'but what of all that? 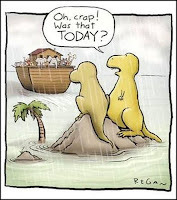 Those things were but for a moment, and we are now here. We have been faithful during a few moments in our mortality, and now we enjoy eternal life and glory, with power to progress in all the boundless knowledge and through the countless stages of progression, enjoying the smiles and approbation of our Father and God, and of Jesus Christ our elder brother.'" My kitchen floor is a white vinyl made to look like tile. While I mop it regularly, it does need a really super-duper cleaning a few times a year. After trying lots of products to cut through the dirt, gunk and floor cleaner, I found the best and easiest product was the Clean Team's Red Juice Concentrate. Full strength, straight out of the bottle and onto the floor. While I love Clean Team products, $15 a bottle for the concentrate was a very expensive way to clean a floor. So I went on the hunt for a replacement floor stipper/degreaser/cleaner. First I went online to see if others had done what I was doing. I did learn I was going to need to look for the product in a store's automotive section. Then I started buying products to see what worked. I am happy to say I found one, but not without some trade-offs. The winner is: Purple Power by Aiken Chemical Company. I bought a 40 oz. spray bottle of this industrial degreaser for about $4 at Pep Boys. It is even cheaper if you buy it by the gallon. I sprayed it, undiluted, on the floor, waited a few minutes and then wiped off. Then rinsed and put a finish coat on the floor. It worked really well. Trade offs: Red Juice is non-toxic and approved for use around food. I didn't see that on the Purple Power labels. 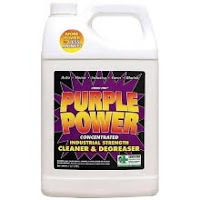 Purple Power does suggest ventilation while using and says not to use it on certain products-do read the label. There weren't strong smelling fumes, but I did ventilate because I did cough a little-but I cough with Red Juice Concentrate as well. Last summer I told myself if I survived my re-election campaign, I wanted to learn how to make artisan bread during the winter months. My goal: a tasty sourdough made without commercial yeast. Today, my adventure began. I got this book from the library and have started my starter. The starter contains water, flour and cheesecloth-bagged grapes, all sitting in a large jar on top of my refrigerator. From what I understand, it will bubble, burble, stink and may grow mold over the next two weeks as it becomes a living creature. Then there are the feedings: 3x a day for the last five days of its growth. Sounds like having another person in the house. I am learning what proofing baskets and cloths are, how to hand knead and the importance of temperature. It is all very interesting. When I am done, I should have a sturdy, sour starter. Yay! I am also a wife, mother, elected official, cyclist, nerd, church volunteer, musician,victim of adult-onset athleticism, community volunteer, and homemaker. I am married to Fun Has Arrived (FHA) and am mother of Astronerd and B. Contact me at Karenchronicles at gmail dot com. No, I don't have the time for this! Thats right I have a blog! You are welcome to link to my blog, but please get my permission before copying any text or original photos. Thanks!